Heat the oven to 400°F. Spray 16 (1 1/2-inch) mini muffin-pan cups with vegetable cooking spray. Stir the chocolate hazelnut spread and caramel topping in a small bowl. Sprinkle the flour on the work surface. Unfold the pastry sheet on the work surface. Roll the pastry sheet into a 10-inch square. Cut the pastry into 4 (2 1/2-inch wide) strips. Cut each strip into 4 (2 1/2-inch) squares, making 16. Press the pastry squares into the mini muffin-pan cups. Prick the bottoms of the pastries with a fork. Bake for 10 minutes or until the pastries are golden brown. Let the pastries cool in the pan on a wire rack for 5 minutes. 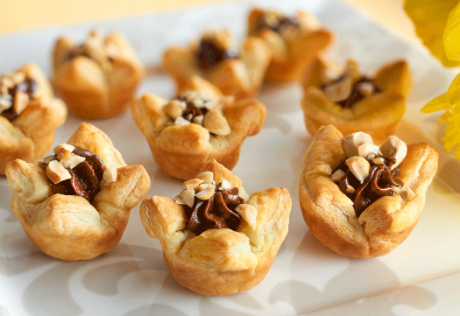 Spoon or pipe about 1 teaspoon hazelnut caramel mixture into each pastry cup. Sprinkle each with about 1/4 teaspoon hazelnuts.